The play is on the American idiom (attested since the 1930s) close but no cigar (with several variants), used to say that someone has come close to success but doesn’t quite reach the goal, and so fails to win the prize for success — fails to win the metaphorical cigar. 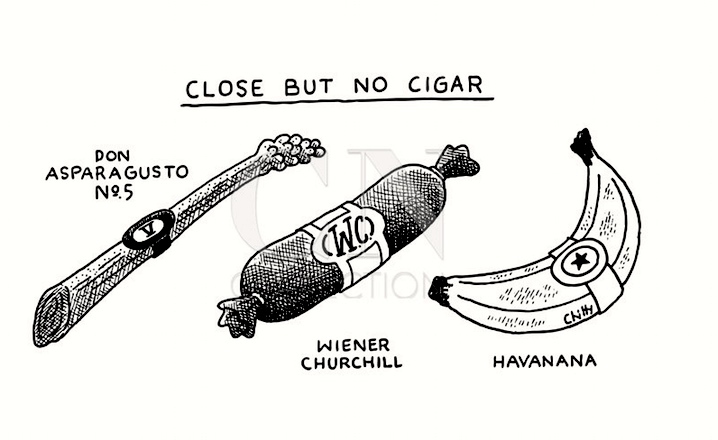 In Chitty’s cartoon, cigarhood is, absurdly, the actual goal of repurposing food. Don Asparagusto No. 5 takes a spear of asparagus and mashes the word asparagus up with the cigar name Don Augusto and the cigar name Montecristo No. 5, in a complex portmanteau. Note the Roman number V on the band. Wiener Churchill takes a wiener and mashes the word wiener together with the name Winston Churchill, while recognizing that Churchill was a celebrated cigar smoker (who has in fact given his name to a type of cigar). Note the initals WC on the band. Havanana takes a banana and portmanteaus the word banana with the Cuban city name Havana, while recognizing that Cuba and some Cubans (Fidel Castro especially) are famous for cigars. Note the Cuban revolutionary star on the band. Alas, the asparagus spear, the wiener, and the banana all fail to transcend their natures as foodstuffs. Not even the messages of their cigar bands are enough to get them to their goal. This entry was posted on November 17, 2016 at 8:07 pm and is filed under Language and food, Linguistics in the comics, Names, Phallicity, Portmanteaus. You can follow any responses to this entry through the RSS 2.0 feed. You can leave a response, or trackback from your own site.